On March 8, 2016 (March 9 local time) the Moon briefly blocked the light from the Sun in what was the only total solar eclipse of the year. The event was visible across portions of southeast Asia, Indonesia, and Micronesia, and was observed by both skywatchers on the ground in person and those watching live online around the world. While to most the view was of a silhouetted Moon slowly carving away the disk of the Sun before totality revealed a shimmering corona, the view from space looking back at Earth showed the Moon’s dark shadow passing over islands, clouds, and sea. At long last, beautiful new high resolution views of the rotating Earth can be seen daily by everyone at a new NASA website – all courtesy of images taken by NASA’s EPIC camera on board the Deep Space Climate Observatory (DSCOVR) spacecraft. And as seen in the time-lapse animation above, they provide a wonderful new asset for students everywhere to learn geography that’s just a finger tip away! The EPIC camera, which stands for Earth Polychromatic Imaging Camera (EPIC), is located a million miles away on the DSCOVR real time space weather monitoring satellite and is designed to take full disk color images of the sunlit side of our home planet multiple times per day. The EPIC NASA images are literally just a finger tip away, after a 17 year wait to get the satellite into the launch queue since it was first proposed by former VP Al Gore. They are all easily viewed at NASA’s new EPIC camera website which went online today, Monday, October 19, 2015. This EPIC image was taken on Oct.17 and shows the Australian continent and a portion of Asia. An annotated guide map illustration identifying the visible land masses accompanies each EPIC image and follows along as the Earth rotates daily. What a great geography learning tool for student classrooms worldwide! DSCOVR is a joint mission between NOAA, NASA, and the U.S Air Force (USAF) that is managed by NOAA. The satellite and science instruments were provided by NASA and NOAA. EPIC is a four megapixel CCD camera and telescope mounted on DSCOVR and orbiting around the L1 Lagrange Point – a neutral gravity point that lies on the direct line between Earth and the sun. NASA says that once per day they will post “at least a dozen new color images of Earth acquired from 12 to 36 hours earlier” taken by the agency’s EPIC camera. The EPIC images will be stored in an archive searchable by date and continent. “The effective resolution of the DSCOVR EPIC camera is somewhere between 6.2 and 9.4 miles (10 and 15 kilometers),” said Adam Szabo, DSCOVR project scientist at NASA’s Goddard Space Flight Center, Greenbelt, Maryland, in a statement. The couch sized probe was launched atop a SpaceX Falcon 9 on Feb. 11, 2015 from Cape Canaveral, Florida, to start the million mile journey to its deep space observation post at L1. The rocket was funded by the USAF. The primary goal of the $340 million DSCOVR satellite is to monitor the solar wind and aid very important forecasts of space weather at Earth from L1. L1 is located 1.5 million kilometers (932,000 miles) sunward from Earth. At L1 the gravity between the sun and Earth is perfectly balanced and the DSCOVR satellite orbits about that spot just like a planet. The mission is vital because its solar wind observations are crucial to maintaining accurate space weather forecasts to protect US infrastructure such as power grids, aviation, planes in flight, all types of Earth orbiting satellites for civilian and military needs, telecommunications, ISS astronauts and GPS systems. DSCOVR was first proposed in 1998 by then US Vice President Al Gore as the low cost ‘Triana’ satellite to take near continuous views of the Earth’s entire globe to feed to the internet as a means of motivating students to study math and science. The probe was eventually resurrected and partially rebuilt at NASA Goddard Space Flight Center as a much more capable Earth science satellite that would also conduct the space weather observations. But Triana was shelved for purely partisan political reasons and the satellite was placed into storage at NASA Goddard. Thus the practical and teachable science and daily scenes of the gorgeously rotating Earth were lost – until now! “Today @NASA launched its site for #DSCOVR’s daily images. I look forward to seeing more from #DSCOVR,” tweeted Al Gore. An eye-poppingly ‘EPIC’ view of the sunlit far side of the Moon transiting the sunlit side of Earth was recently captured by NASA’s Earth Polychromatic Imaging Camera (EPIC) camera from one million miles away. “Wow!” – is an understatement! The stunning animation of the Moon crossing in front of the Earth, shown above, and seemingly unlike anything else, was created from a series of images taken in July by NASA’s EPIC camera flying aboard the orbiting Deep Space Climate Observatory (DSCOVR), a space weather monitoring satellite, according to a NASA statement. Have just witnessed NASA’s New Horizons flyby of the Pluto-Charon double planet system, the similarity to what some call the Earth-Moon double planet system is eerie. You could imagine ones heart going out to Earth’s Australian continent as an upside down version of Pluto’s bright heart shaped ‘Tombaugh Regio’ region in the southern hemisphere. EPIC is a four megapixel CCD camera and telescope mounted on DSCOVR and orbiting at the L1 Lagrange Point – a neutral gravity point that lies on the direct line between Earth and the sun. The goal of the $340 million DSCOVR is to monitor the solar wind and aid very important forecasts of space weather at Earth from L1. The EPIC images “were taken between 3:50 p.m. and 8:45 p.m. EDT on July 16, showing the moon moving over the Pacific Ocean near North America,” NASA said. You can see Earth’s North Pole at the upper left side of the images which results from the orbital tilt of Earth from the vantage point of the spacecraft at the L1 Lagrange Point. EPIC will take full disk color images of the sunlit side of Earth at least six times per day. They will be made publically available by NASA at a dedicated website, when the camera starts its regular daily science observation campaign of the home planet in about a month during September. NASA says the images will show varying views of the rotating Earth and they will be posted online some 12 to 36 hours after they are acquired. Each image is actually a composite of three images taken in the red, green and blue channels of the EPIC camera to provide the final “natural color” image of Earth. Since the images are taken about 30 seconds apart as the moon is moving there is a slight but noticeable artifact on the right side of the moon, NASA explained. EPIC should capture these Earth-Moon transits about twice per year as the orbit of DSCOVR crosses the orbital plane of the moon. We never see the far side of the moon from Earth since the bodies are tidally locked. And its quite apparent from the images, that the moon’s far side looks completely different from the side facing Earth. The far side lacks the large, dark, basaltic plains, or maria, that are so prominent on the Earth-facing side. “It is surprising how much brighter Earth is than the moon,” said Adam Szabo, DSCOVR project scientist at NASA’s Goddard Space Flight Center in Greenbelt, Maryland, in a statement. The couch sized probe was launched atop a SpaceX Falcon 9 on Feb. 11, 2015 from Cape Canaveral, Florida, to start a million mile journey to its deep space observation post. The rocket was funded by the USAF. DSCOVR was first proposed in 1998 by then US Vice President Al Gore as the low cost ‘Triana’ satellite to take near continuous views of the Earth’s entire globe to feed to the internet as a means of motivating students to study math and science. It was eventually built as a much more capable Earth science satellite that would also conduct the space weather observations. But Triana was shelved for purely partisan political reasons and the satellite was placed into storage at NASA Goddard and the science was lost until now. This picture of our home planet truly is EPIC – literally! 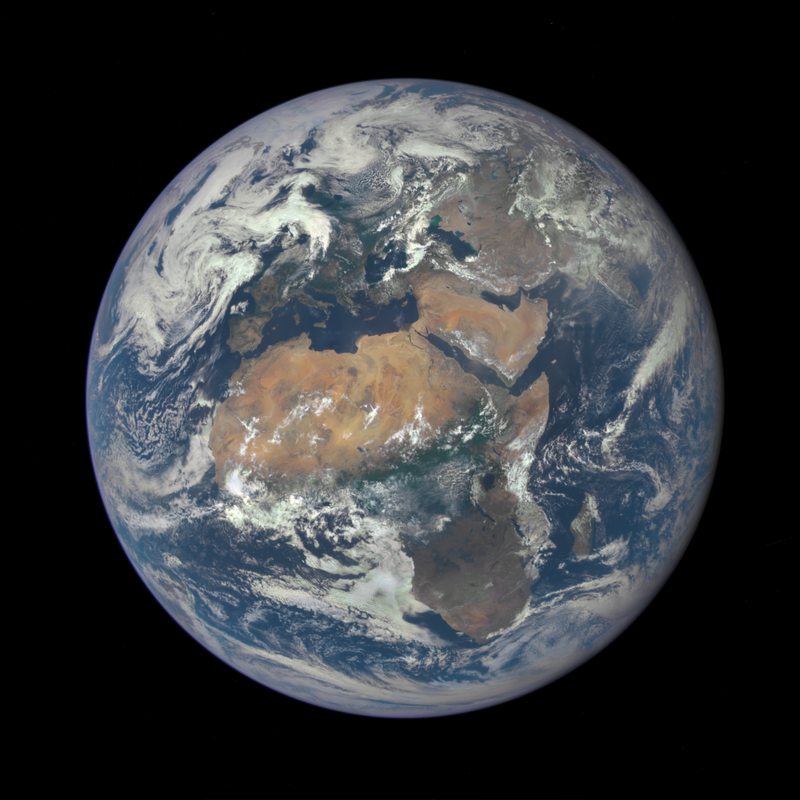 The full-globe image was acquired with NASA’s Earth Polychromatic Imaging Camera (aka EPIC; see what they did there) on board NOAA’s DSCOVR spacecraft, positioned nearly a million miles (1.5 million km) away at L1. L1 is one of five Lagrange points that exist in space where the gravitational pull between Earth and the Sun are sort of canceled out, allowing spacecraft to be “parked” there. (Learn more about Lagrange points here.)  Launched aboard a SpaceX Falcon 9 on Feb. 11, 2015, the Deep Space Climate Observatory (DSCOVR) arrived at L1 on June 8 and, after a series of instrument checks, captured the image of Earth’s western hemisphere above on July 6. The EPIC instrument has the capability to capture images in ten narrowband channels from infrared to ultraviolet; the true-color picture above was made from images acquired in red, green, and blue visible-light wavelengths. More than just a pretty picture of our blue marble, this image will be used by the EPIC team to help calibrate the instrument to remove some of the blue atmospheric haze from subsequent images. Once the camera is fully set to begin operations daily images of our planet will be made available on a dedicated web site starting in September. But also, from its permanent location a million miles away, DSCOVR will be able to get some truly beautiful – er, EPIC – images of our world. DSCOVR is a joint mission between NOAA, NASA, and the U.S. Air Force. Learn more about DSCOVR here. UPDATE: President Obama liked this image so much, he decided to Tweet about it with a message of planetary conservation! The POTUS’ Tweet about the DSCOVR image on July 20, 2015. The long awaited Deep Space Climate Observatory, or DSCOVR science satellite is slated to blast off atop a SpaceX Falcon 9 on Sunday, Feb. 8, from Cape Canaveral, Florida on a mission to monitor the solar wind and aid very important forecasts of space weather at Earth. DSCOVR is a joint mission between NOAA, NASA, and the U.S Air Force (USAF) that will be managed by NOAA. The satellite and science instruments are provided by NASA and NOAA. Update Feb 8: Hold, Hold, Hold !!! 6:10 PM 2/8/15 Terminal Count aborted at T Minus 2 min 26 sec due to a tracking issue. NO launch of Falcon 9 today. rocket being safed now. next launch opportunity is Monday. Still TBD. The rocket is provided by the USAF. SpaceX will try to recover the first stage via a guided descent to a floating barge in the Atlantic Ocean. The weather outlook is currently very promising with a greater than 90 percent chance of favorable weather at launch time shortly after sunset on Sunday which could make for a spectacular viewing opportunity for spectators surrounding the Florida Space coast. Liftoff atop the SpaceX Falcon 9 rocket is targeted for at 6:10:12 p.m. EST on Feb. 8, from Cape Canaveral Air Force Station Space Launch Complex 40. There is an instantaneous launch window, meaning that any launch delay due to weather, technical or other factors will force a scrub to Monday. NASA’s DSCOVR launch blog coverage of countdown and liftoff will begin at 3:30 p.m. Sunday. “DSCOVR is NOAA’s first operational space weather mission to deep space,” said Stephen Volz, assistant administrator of the NOAA Satellite and Information Service in Silver Spring, Maryland, at the pre-launch briefing today (Feb. 7) at the Kennedy Space Center in Florida. The mission of DSCOVR is vital because its solar wind observations are crucial to maintaining accurate space weather forecasts to protect US infrastructure from disruption by approaching solar storms. “DSCOVR will maintain the nation’s solar wind observations, which are critical to the accuracy and lead time of NOAA’s space weather alerts, forecasts, and warnings,” according to a NASA description. DSCOVR will replace NASA’s aging Advanced Composition Explorer (ACE) satellite which is nearly 20 years old and far beyond its original design lifetime. The couch sized probe is being targeted to the L1 Lagrange Point, a neutral gravity point that lies on the direct line between Earth and the sun located 1.5 million kilometers (932,000 miles) sunward from Earth. At L1 the gravity between the sun and Earth is perfectly balanced and the satellite will orbit about that spot just like a planet. L1 is a perfect place for the science because it lies outside Earth’s magnetic environment. The probe will measure the constant stream of solar wind particles from the sun as they pass by. This will enable forecasters to give a 15 to 60 minute warning of approaching geomagnetic storms that could damage valuable infrastructure. DSCOVR is equipped with a suite of four continuously operating solar science and Earth science instruments from NASA and NOAA. It will make simultaneous scientific observations of the solar wind and the entire sunlit side of Earth. The 750-kilogram DSCOVR probe measures 54 inches by 72 inches. I saw the DSCOVR spacecraft up close at NASA Goddard Space Flight Center in Maryland last fall during processing in the clean room. A secondary objective of the rocket launch for SpaceX is to conduct their second attempt to recover the Falcon 9 first stage booster on an ocean going barge. Read my articles about the first attempt in January 2015, starting here. It was originally named ‘Triana’ (aka Goresat) and was conceived by then US Vice President Al Gore as a low cost satellite to take near continuous views of the Earth’s entire globe to feed to the internet as a means of motivating students to study math and science. It was eventually built as a much more capable Earth science satellite as well as to conduct the space weather observations. But Triana was shelved for purely partisan political reasons and the satellite was placed into storage and the science was lost until now. Solar wind – that is, the stream of charged electrons and protons that are released from the upper atmosphere of the Sun – is a constant in our Solar System and generally not a concern for us Earthlings. However, on occasion a solar wind shock wave or Coronal Mass Ejection can occur, disrupting satellites, electronics systems, and even sending harmful radiation to the surface. Little wonder then why NASA and the National Oceanic and Atmospheric Administration (NOAA) have made a point of keeping satellites in orbit that can maintain real-time monitoring capabilities. The newest mission, the Deep Space Climate Observatory (DSCOVR) is expected to launch later this month. A collaborative effort between NASA, the NOAA, and the US Air Force, the DSCOVR mission was originally proposed in 1998 as a way of providing near-continuous monitoring of Earth. However, the $100 million satellite has since been re-purposed as a solar observatory. In this capacity, it will provide support to the National Weather Service’s Space Weather Prediction Center, which is charged with providing advanced warning forecasts of approaching geomagnetic storms for people here on Earth. These storms, which are caused by large-scale fluctuations in solar wind, have the potential of disrupting radio signals and electronic systems, which means that everything from telecommunications, aviation, GPS systems, power grids, and every other major bit of infrastructure is vulnerable to them. In fact, a report made by the National Research Council estimated that recovering from the most extreme geomagnetic storms could take up to a decade, and cost taxpayers in the vicinity of $1 to $2 trillion dollars. Add to the that the potential for radiation poisoning to human beings (at ground level and in orbit), as well as flora and fauna, and the need for alerts becomes clear. Originally, the satellite was scheduled to be launched into space on Jan. 23rd from the Cape Canaveral Air Force Station, Florida. However, delays in the latest resupply mission to the International Space Station have apparently pushed the date of this launch back as well. According to a source who spoke to SpaceNews, the delay of the ISS resupply mission caused scheduling pressure, as both launches are being serviced by SpaceX from Cape Canaveral. However, the same source indicated that there are no technical problems with the satellite or the Falcon 9 that will be carrying it into orbit. It is now expected to be launched on Jan. 29th at the latest. 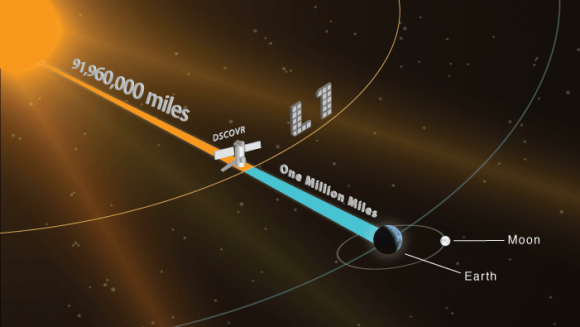 Once deployed, DSCOVR will eventually take over from NASA’s aging Advanced Composition Explorer (ACE) satellite, which has been in providing solar wind alerts since 1997 and is expected to remain in operation until 2024. Like ACE, the DSCOVER will orbit Earth at Lagrange 1 Point (L1), the neutral gravity point between the Earth and sun approximately 1.5 million km (930,000 mi) from Earth. From this position, DSCOVR will be able to provide advanced warning, roughly 15 to 60 minutes before a solar wind shockwave or CME reaches Earth. This information will be essential to emergency preparedness efforts, and the data provided will also help improve predictions as to where a geomagnetic storm will impact the most. These sorts of warnings are essential to maintaining the safety and integrity of infrastructure, but also the health and well-being of people here on Earth. Given our dependence on high-tech navigation systems, electricity, the internet, and telecommunications, a massive geomagnetic storm is not something we want to get caught off guard by!